Keep your students organized for Read Naturally Encore, Masters Edition, GATE, Word Warm-ups, and Take Aim at Vocabulary programs. Set up folders to hold everything students need for Read Naturally, so they can just grab and go. Built-in pockets and fasteners hold their stories, graphs, and awards. The inside pockets include lines for tracking level and goal assignments. 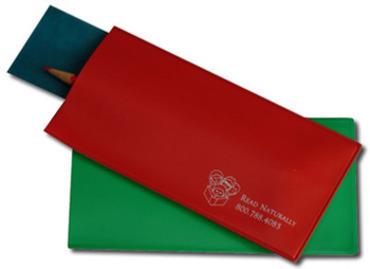 Package of ten sturdy, vinyl pouches (red on one side, green on the other) to hold reading guides and graphing pencils, and for students to signal teachers when they are ready to pass a story. 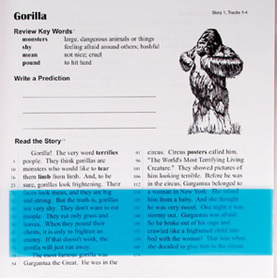 Package of ten sturdy, blue-tinted plastic guides to help students track across the page and to reduce glare. 8.5 inches by 1.5 inches. Box of 12 pencils that are red on one half and blue on the other half. Perfect for graphing cold (blue) and hot (red) timing scores.